Relegating Indilinx to the bottom of the pyramid for now is a bold move for OCZ. Considering how much business OCZ has given Indilinx over the past year I don’t expect that they are very happy over this move. SandForce’s architecture is on a different level from what we’ve seen from Indilinx. 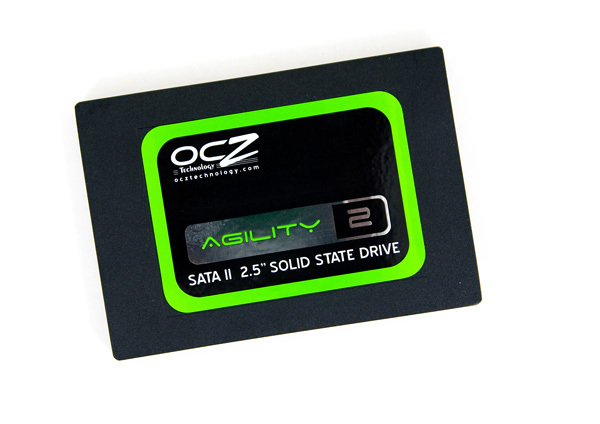 While the Vertex could be viewed as an Intel alternative, OCZ’s Vertex 2 and Agility 2 are designed to offer better-than-Intel performance and as such they actually command a higher dollar-per-GB rate. Both the Vertex 2 and Agility 2 are based on SandForce’s SF-1200 controller. I’ve described the differences between this and the SF-1500 in detail here. It boils down to a bunch of enterprise class features missing and lower sustained small file random write speed on the SF-1200 vs. the 1500. The Vertex 2 retains the small file random write performance of the SF-1500, while the Agility 2 is a standard SF-1200 implementation. According to SandForce, the Agility 2 is representative of how all other SF-1200 based SSDs will perform using the 1200’s current mass production firmware (more on this later). The Agility 2 ships with a 2.5" to 3.5" drive sled for use in desktops. If you use this sled the SATA ports won't line up with drive trays in systems like the Mac Pro. 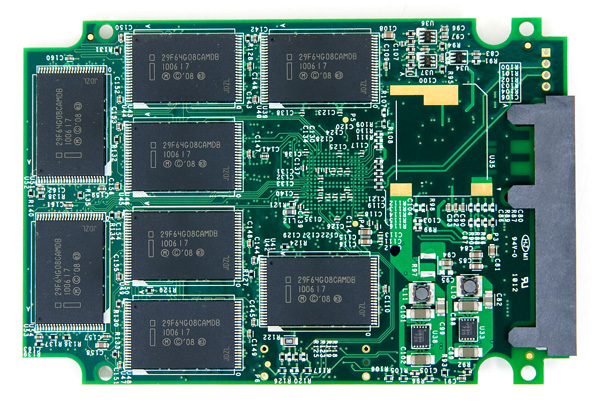 Inside the drive itself we find SandForce’s SF-1200 controller and no external DRAM. SandForce’s architecture attempts to solve the issue of NAND write amplification by simply writing less to the drive through compression/deduplication techniques. With less data to keep track of, a large external DRAM isn’t necessary - assuming the data being written is easily reduced by SandForce’s algorithms. SandForce also claims that its reduced write amplification could enable the use of cheaper NAND on these drives. 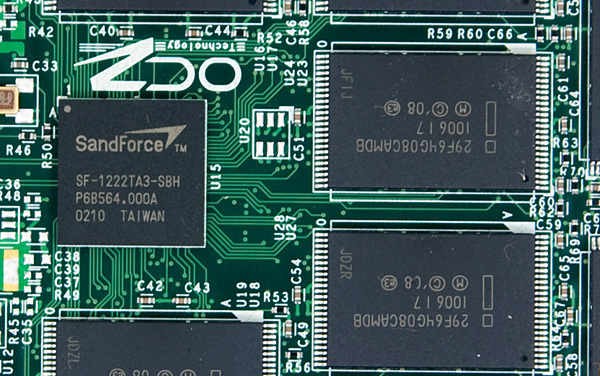 It’s an option that some manufacturers may take however OCZ has committed to using the same quality of NAND as it has in the past. The Agility 2 uses 34nm IMFT NAND, presumably similar to what’s used in Intel’s X25-M G2. The Agility 2 sample OCZ sent had the first SF-1200 mass production firmware (v3.0.5) from SandForce on it with full TRIM support. The Agility 2 should begin shipping to etailers later this month. I thought the OWC controllers were discovered to have the SF 1200 controllers? Those numbers are from the older OWC Mercury which used a limited run of SF-1500. The newer drives going forward are SF-1200 based. I'll be phasing them out of our graphs as a result. I agree on the prices... Street prices of OCZ's Indillix drives are much lower than that Corsair Nova for instance, since OCZ ALWAYS has $20-30 rebates going on their drives (and they're just cheaper to begin with)... OCZ's Nova equivalent, the Solid 2, is like $300 flat after MIR. "The SandForce SF-1200 controller used in the A-DATA S599 with Intel’s latest RST 9.6 drivers is the fastest 2.5 inch solid state drive for Windows users at this time. This combination is able to outperform every other drive we have tested to date in all around performance." Source tweaktown but they compared it to another 1200 drive instead of using the same ssd with both drivers. This is what intel says "Is there TRIM support for RAID configurations? Intel® Rapid Storage Technology 9.6 supports TRIM in AHCI mode and in RAID mode for drives that are not part of a RAID volume.